A Great Generation Passes... A New One Begins! I have to admit I was a little misty eyed knowing the C5 is winding down that final road of production into Corvette history. It seems like only moments ago that Dan Douglas (our first member V0003 nicknamed "DataDan") asked me on Cafaro's Hill...What type of Corvette club is this? Truth be known, I really wasn't sure...but I was sure EXCITED about my new '97 Torch Red 6-Speed Z51 Coupe and I wanted to tell the world about it! And, yes, "DataDan" has told me many times that this has been one of the greatest organizations he has ever been involved with. I want to thank David Hill for his very complimentary comments regarding the C5 Registry and what we had accomplished as an organization for the 5th generation of Corvette during his introduction speech for the 6th generation of Corvette at the National Corvette Museum. The Registry has been very fortunate to have wonderful friends like David Hill. The reason is not because of anything Jake and I have done, but it is because of the joyous enthusiasm you, our members, have for the C5 Corvette. Members have heard me say many times when we started the Registry that I thought 300 members would be big enough! I want you to know that had I stopped there, I would have missed the opportunity to have NOT known 7,200+more C5 Corvette owners and that would have been a tragedy! Registry members are the ULTIMATE and they love to have FUN! Some of you may recall when the Registry first began that the important part "I thought" was the C5 Corvette. But the vision became clear that the Registry isn't about America's Sports Car, it's ONLY about the members. Because of you we have access to all kinds of C5 information and GM folks to talk and visit with. Our member's positive attitudes and enthusiasm carries over throughout the NCM and to the Halls of General Motors. I am proud to say that today the friendships I have made are without a doubt the most important part of the Corvette lifestyle. Members, you have made this a wonderful experience with memories to fill a lifetime. Yes, it may have taken me a while to understand the C5 way, but it didn't take you any time to realize the important part of Corvetting is the friendships. The Birthday Bash was the first event we decided on as an organization eight years ago. This event has grown into the second largest party held at the National Corvette Museum. It is said that the NCM Birthday Bash is synonymous with the C5 Registry and we couldn't agree more. Members who attended are saying this 7th Annual Birthday Bash was the Best Bash Ever! The kindness shown by General Motors (with the introduction of the 6th generation of Corvette) and the NCM in nurturing this event has never bee better. For those of you present, you know how much FUN it was and for those of you who could not attend, I would mark April 21-23, 2005 as the date for next year. Of course we have launched our new C6 Corvette web site for our member's enjoyment. My eyes are dry and clear and I see the Registry embarking on a new super highway driven by Registry members who are both C5 and C6 owners. Shifting through the gears we may have a few operational problems in the beginning as we combine these two generations of members. This challenging task to put two generations of members under one roof will have its pot holes in the road and some tight curves, but our efforts will be focused on keeping our members together. But with your support and understanding we are confident that the shifting of gears will be smooth and synchronized. 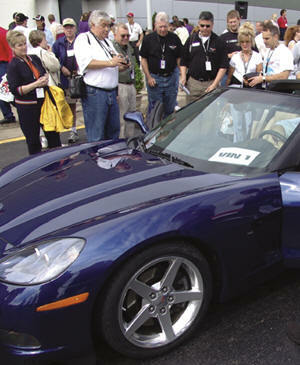 The C6 Corvette promises, and I know David Hill and Wil Cooksey will deliver, "THE GREATEST CORVETTE EVER!" Already the racing season has heated up with a victory at 12 Hours of Sebring. News just in that Dale Jr. and Boris Said will be joining forces to race the C5R at Infineon Raceway, Sonoma, California July 16-18. Their presence alone will make this race a must attend event. See the Upcoming Events page for more information. Speaking of upcoming Registry events, this 2004 show season is going to be a blast! Although we are all saddened by the loss of a great friend, Chip Miller of Carlisle Productions, we will continue to dominate "The Hill" at Carlisle that Chip said "no one else ever wanted" with C5s and maybe a C6 or two. In the beginning of the Registry Chip had faith in us when very few others did. He was a source of positive influence and always showed us his kindest regards. Chip Miller was an example that nice people do finish first! 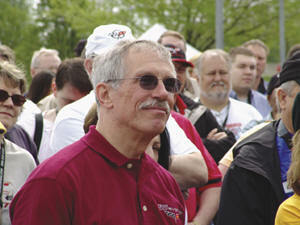 And those of you who knew him can attest that the Corvette hobby has lost one of its finest. Join us as we continue to pray for Judy Miller and the family during this time. "YES"...I've received all your emails and "YES" we will once again take (in June 2005) twenty C5s and/or C6s to the shores of France, the countryside of Italy, the Nuremburg Ring in Germany and to the 24 Hours of Le Mans. For all of you who have told me you are interested in joining us for the first Le Mans running of the C6 styled C6R Corvette, please email me at c5dan@c5registry.com (subject line: TAKE ME RACING IN FRANCE) and we'll keep you on the "Hot List" with updates regarding our plans and trip itinerary. Currently our plan is to post the details of this once in a lifetime trip by mid September 2004 and accept deposits starting November 1, 2004. Please remember we are limited to only twenty Corvettes. Fire up your Corvette. This summer is starting to sizzle! I'll "C Ya" at one of our events. Copyright Laws. - Do not copy material without the express written consent of the Official C6 Registry Inc.
© CORVETTE, CORVETTE LOGOS, and insignia are registered trademarks of the General Motors Corporation & Chevrolet Motor Division. Chevrolet Motor Division nor any subsidiaries of GM© shall bear any responsibility for The Official C6 Registry website content, editorials, or comments. The Official C6 Registry is independent from General Motors©, Chevrolet©, or Corvette©, and is not affiliated with, sponsored or by General Motors©, Chevrolet©, or Corvette©.